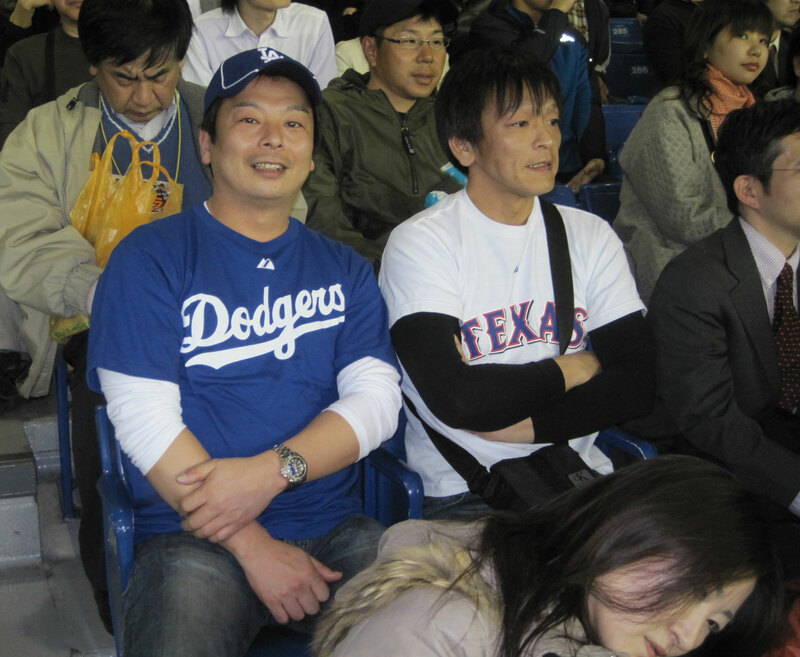 Only two teams could make the trip to Japan to play in front of Tokyo’s 42,000 biggest baseball fans. But that doesn’t mean the A’s and Mariners were the only clubs represented in the Big Egg tonight. Got a few issues with this guy’s parenting. No. 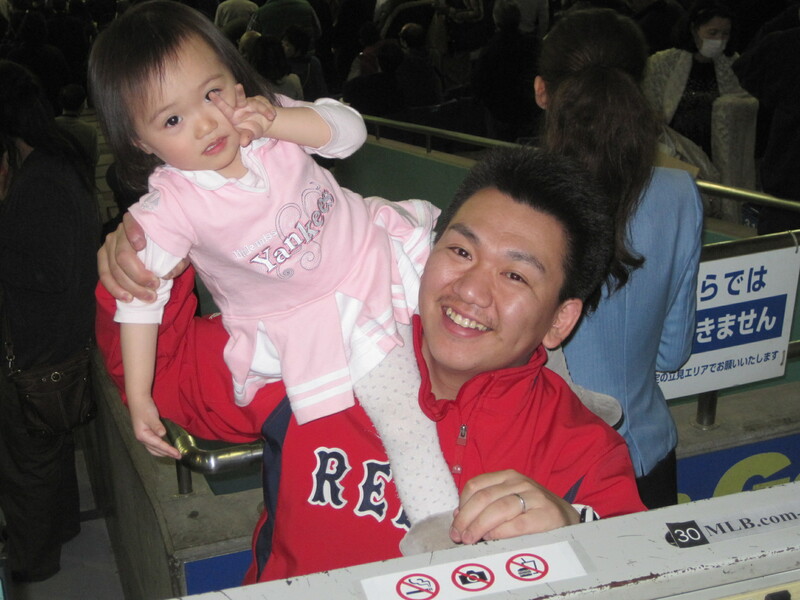 1: If you’re a Red Sox fan, how do you let your daughter out of the house in a Yankees dress? No. 2: Fine, so you admit failure and allow her to root for your favorite team’s rival. That’s bad enough. How do you let her walk around in a pink Yankees shirt. At least suffer the embarrassment of a house divided in midnight blue. And No. 3: Teaching her the peace sign this early ensures a lifetime of touristy photobombing. Somebody is jacked up about Magic Johnson. Either that, or he’s unaware Nomo-mania ended 15 years ago. Also, just a guess, but I don’t think that Texas T-shersey has Matt Harrison’s No. 54 on the back. 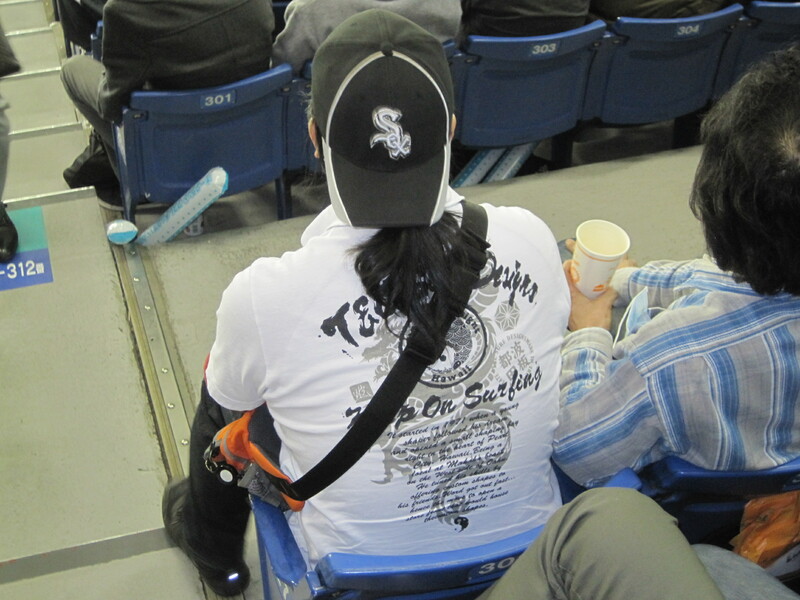 Orange fanny pack around his shoulder AND a pony tail under the backwards hat? This is a man not afraid of life’s bolder flavors. I bet he orders omakase from the ballpark sushi chef and doesn’t even pile on a bunch of ginger when he eats the questionable fish pieces. 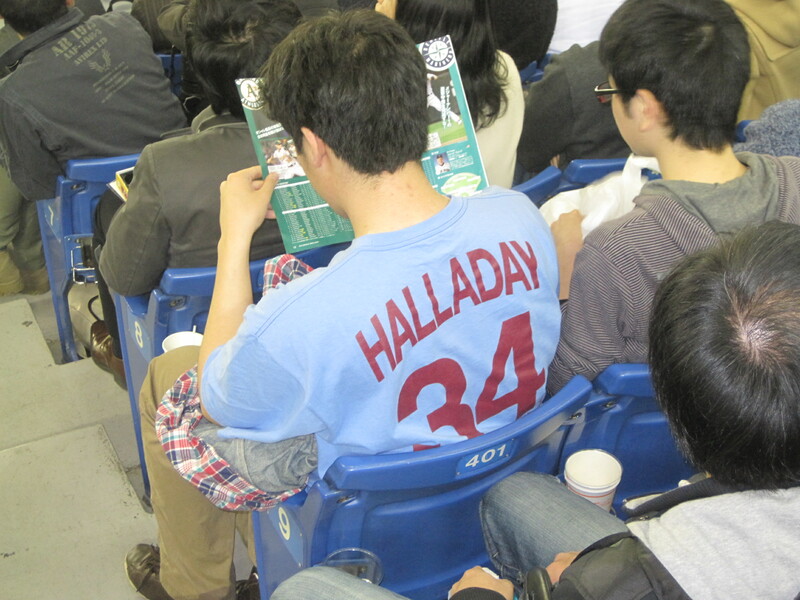 Does this count as a Marlins fan sighting? The Mr. Met hat says otherwise. Fans would love Mr. Met over here. He fits right in with the half-lovable, half-terrifying trend we saw in mascots for both the Hanshin Tigers and Yomiuri Giants this week. And in Thumper too, for that matter. Little-known fact: Now that the Rockies have released Casey Blake, Doc Halladay is the only bearded MLB player not on the Oakland A’s 25-man roster. Collin Cowgill, Josh Reddick, Andrew Carignan… Seriously, that team has like seven dudes with the exact same mountain man look. 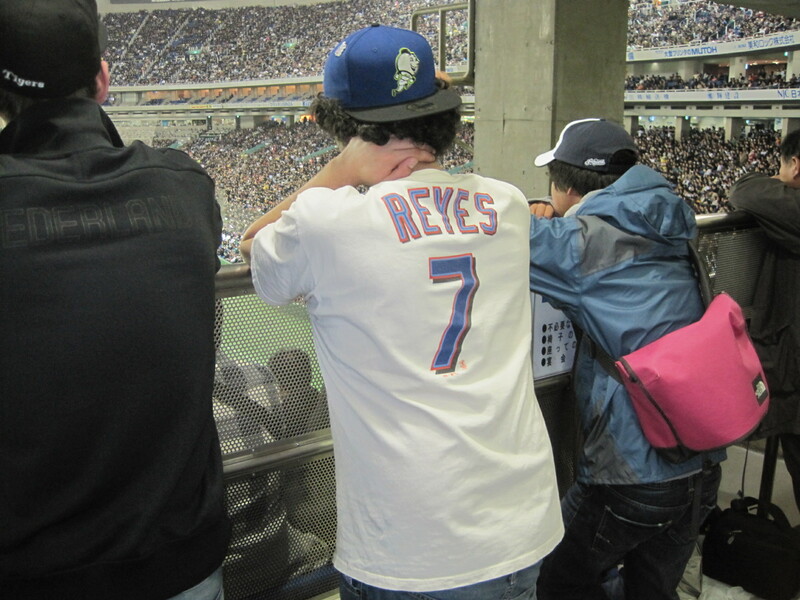 I’ve been a little surprised at how few fans are sporting the interlocking NY at the Tokyo Dome this week. 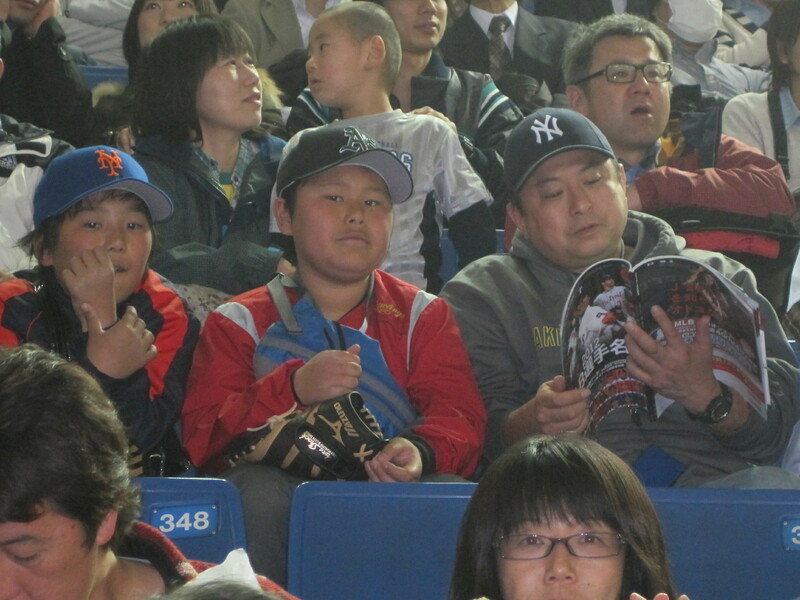 Guess Hideki Matsui couldn’t make the Yankees hat more famous than the Yankees can. I think R.A. Dickey has a beard,too.